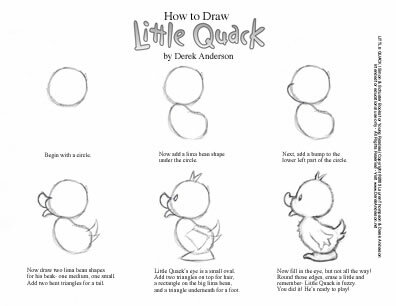 Did you know you can draw Little Quack? You can, it's easy! Click on the sheet below, print it and follow the step-by-step instructions! This image will fit on a standard-size sheet of paper. Get your Crayons! You can choose between three different pictures. and show your friends and family what a great artist you are! Each image will fit on a standard-size sheet of paper. 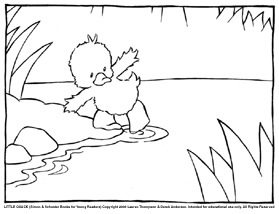 Puddle and Little Quack from the book, Little Quack. We have Little Quack tentatively dipping his foot in the pond. And we have a drawing of Derek from when he was little. 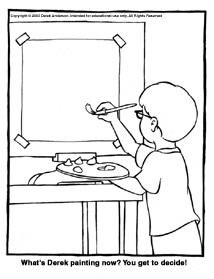 But in this picture, you get to decide what Derek is painting! Can't Decide on One? Print Them All!